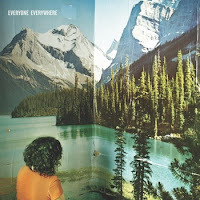 For the second time, Philly-based Everyone Everywhere have decided to release a self-titled album. While the first, released in 2010 through Tiny Engines, was essentially given away for free one track at a time on the “Everyone Everywhere MP3 Blog Tour,” the second – which will be self-released in the US – had 100 vinyl pre-order presses offered at the name-your-price strategy in early July. It sold out in less than half an hour, and the album scored top spot for best-selling vinyl on Bandcamp the same week pre-orders were up. But if you’re one of the cheapskates who took advantage of the band’s generosity and only paid a dollar for "Everyone Everywhere", you might want to think about coughing up some more cash. What is most striking about the record is how each track is equalized - not just volumized and leveled, but each instrumental section has an equal stake in the song. The horns aren’t buried in the back, the bass lines are thick, and Brendan McHugh’s vocals don’t overextend above everyone else. It’s immediately noticed on opener “I Feel Exhausted,” whose bass line hums in the back as the drums roll in, soon partnered with cymbals that all accumulate to a nearly three-minute intro to the rest of the song. The transition is characteristic of the rest of the album, whose songs tend to unexpectedly switch gears and make turns down different roads, each with their own intention. The instant start to “Queen Mary II” has some of the sharpest drumming thanks to Brendan Graham keeping some not-so-standard time. Poppy, hollowed drums bounce under a frantic shaker and rute-like spats, and a horns section suddenly gusts this song into the absolute highlight of the album (the band recently released a music video for the track, featuring Spice Lee and his awkward green-screened direction with a sweaty green-screened alien taking over the saxophone – a highly recommended watch). Everyone Everywhere is stealthy about its instrumentals. The off-key electric with ear-piercing feedback in “The Future” adds an entirely new character to the otherwise peaceful track, and the riffs of “$1,000,000,000” heavily pulled through an amp, both emerge through their songs unexpectedly. “Turn and Go and Turn” similarly features a counterpoint to the Midwest-styled guitar layering, when what first sounds like an obscure, computerized blip in the background eventually takes over with some messing around with the soundboard knobs. The most poignant of these out-of-nowhere touches is within “Fervor and Indifference in the Bica.” A prominent bass line and a simple keyboard riff accompany the sound of heavy acoustic picking until a furious moment of animal-style drumming almost derails the whole song. The fury suddenly calms to let the acoustic step forward, and is soon joined by a banjo and, eventually, even a type of wind instrument for a few notes. The rest of the album falls dangerously close to monotony, except for the grungy intro to “No Furniture” and its bluntly observational lyrics that carry into “Big Hat.” Luckily “Wild Life” takes the album back to unpredictability, shifting between four-, six- and seven-beat cuts of, all music technicality aside, a mesmerizingly calm exit. Everyone Everywhere trust their fans will give the band what they deserve. While it’s just a 36-minute run, the band’s latest self-titled is pressed with some of the most dynamic touches of the year, and worth way more than 50 cents a track – so pay up. “Everyone Everywhere” is out now.